Discussion in 'Pokémon Manga Discussion' started by lolipiece, Jun 6, 2017. I think the master trainers could work for the Pokemon Association in the manga if Kusaka wants to put them in the manga . If there is a LGPE Chapter. Since this is Future Special stuff, we can talk about the BW2 arc right? I don't know if anyone has already realized this and talked about this but it just occurred to me that the last location Blake and Whitley were in is the Abyssal Ruins which is literally right next to much of the new locations and the central plot events to BW2's story, such as Colress's freezing of Opelucid City, Hugh finds his sister's Purrloin evolved into a Liepard, Kyurem's original home where Ghetsis meets his match and during the two-year time skip Iris is the new Pokemon Champion. I wonder much of this that happens up in Northern Unova will be included in the BW2 chapter. With how chill Ghetsis is I wonder if Kusaka is going to make Ghetsis break down to the point he loses his sanity. So how do you think about Red, Green, and Blue (Leaf?) appear in LGPE? Saw the Let's Go trailer featuring Red, Green and Blue. Have you seen the Pokemon Adventure fans gather together and FREAKING OUT over this!? I haven't this many Pokemon Adventure fans happily gather together in a long time. That makes me so happy. This isn't even Blue in her new design, this is Blue in her classic design! OH MY GOD! If GameFreak surprised everyone with Yellow, Pokemon Adventure fans are going to get a heart attack. On a side note, the games confirmed Red, Green and Blue are separate from the Let's Go Protagonists. Honestly I'm fairly surprised at that. They legitimately looked like Red, Green and Blue. I wonder if the old Gen 1 crew are going to act like senior mentors with lots of experience to the protagonists in both the games and manga. Y'know, Lyra's a different character than Kris, and we all know how Pokespe adapted her. 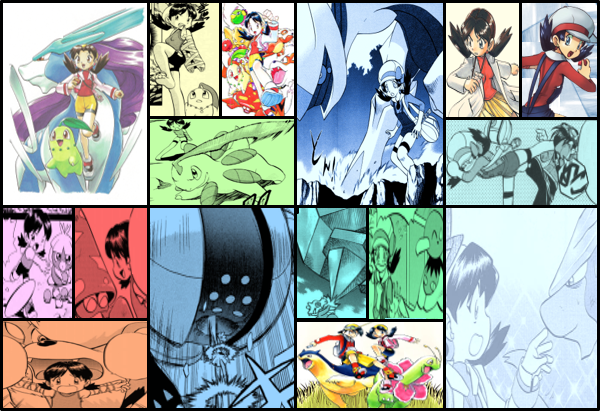 As nice as it is to see Leaf finally be acknowledged after being snubbed three times over since HGSS, it has nothing to do with Pokespe, so I find it hard to call it completely relevant to Pokespe in general. As nice as it is to see Leaf finally be acknowledged after being snubbed three times over since HGSS, it has nothing to do with Pokespe, so not like it's all that relevant. It does confirm that the Let's Go protagonists are seperate from the original Gen 1 protagonists... WHICH MEANS... are we going to get a Let's Go Arc featuring these new protagonists similar to BW2 did for 5th gen? Nothing ever indicated they weren't separate. Yes but a lot of fans assumed that the new "Red, Blue and Green" would be replacements to the previous. Having this conversation I just realized something. 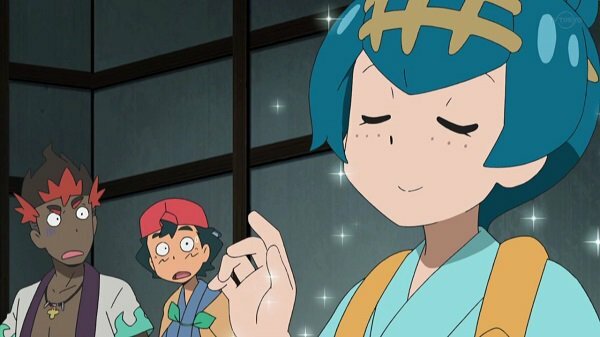 Is it possible, because of how Red, Blue, Green and Yellow are never getting any younger, that the new male, female protagonist and rival Trace will be the new Kanto Pokedex Holders to continue whatever adventures Kanto may have? What would they even be called? Let's and Go? Pikachu and Evee? X. Y. Lack-Two. Whi-two. lol. Those names are actually not as unlikely as it seems. Honestly I wonder if someone had a similar conversation about this when Pokemon X and Y were announced. You'd be surprised at how possible "Let's" and "Go" as names could be. Retsu is a pretty good sounding name honestly. And if they name the female protagonist by version name, this will make Trace (the new rival) a successor after Hugh who cannot become a Pokedex holder just because the versions are insufficient. You know. It's quite possible they won't give them the name "Let's" and "Go" since GameFreak intends the Let's Go games as a series featuring other games with "Let's Go" in it. It could be possible the two Let's Go protagonists will be given names similarly to Pikachu and Eevee, kind of like nicknames. For example, they can give them the names Kachu or Eve. Honestly I do think the best course of action is to use the next year to finish Sun and Moon before the new gen comes out. Have Yellow come back like Blue in XY for whatever contrived reason and give Moon an Eevee. Show off Eevee and Pikachu's new moves and call it a day. I don't think anyone wants Let's Go to go the way of BW2. Kusaka hasn't been following the "use every single move at least once" thing in a while now. Heck, we're 20-something chapters into SM and a grand total of three Gen VII moves have actually been used (and one was a mention, so it's really just two). Well I see your point. You think they wouldn't show off any of them though? Pikachu gets like, three exclusive moves while Eevee gets one for each of its evolutions. Plus they both have an exclusive Friendship-based attack, so that's about a dozen in all. It'd be hard it implement every single one without massively breaking the flow of the story, probably. So guys. You know how there's a lot of connections to be made that Let's Go Green is based on Adventures Green? Well what do you think about a more creepier psycho take on Green that some Adventure fans have pointed out. You think Kusaka will incorporate that in the manga lol?